New Jersey Tea is a low shrub, generally less than 1 m tall and often profusely branched. Stems are finely hairy, but may become smooth with age. Vegetative stems are perennial, but flowering stems persist for just a single year. 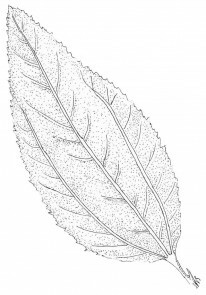 Leaves are mostly 5 to 10 cm long; leaf shape varies from narrowly to widely ovate, acuminate to acute at the apex, and cordate to rounded at the base; leaf margins are finely serrate; both leaf surfaces may be finely hairy, especially on the veins; vein pattern is pinnate with a pair of prominent secondary veins arising near the base. 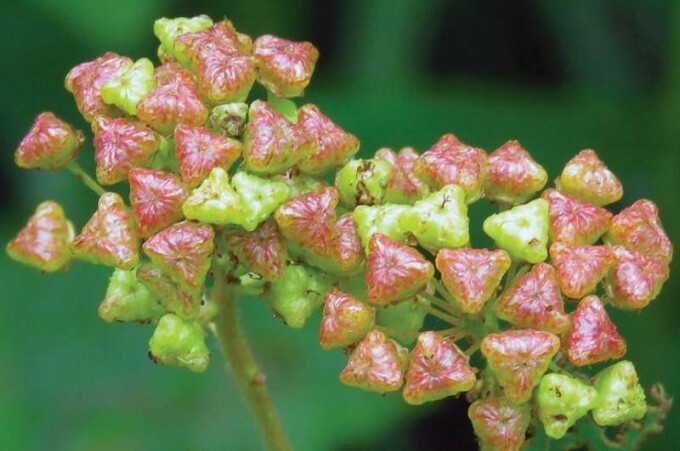 Inflorescences arise from the axils of the uppermost leaves of flowering shoots; pubescent peduncles arising from lower nodes are longer than their subtending leaves, while those arising near the flowering shoot apex are approximately the same length as uppermost leaves. 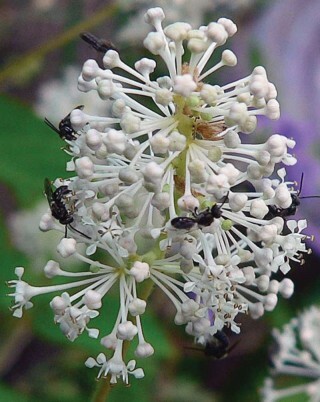 The small fragrant flowers are densely clustered, forming umbel-like groups approximately 2 cm in diameter. Pedicels are glabrous. 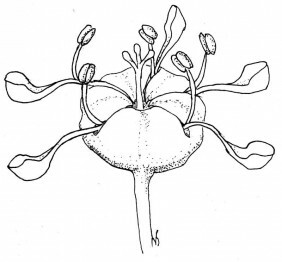 There are five sepals fused for about half their length with their free tips flexed inward, converging toward the style. The five petals have narrow bases and hood- or spoon-like apices that, in the bud, enclose the anthers; at anthesis, petal bases elongate, projecting the broad petal tips to the periphery of the flower. The five stamens are attached in radial alignment with the petals; filaments are oriented vertically, positioning the anthers directly above the central portion of the flower. Ovaries are three-lobed, superior, and positioned atop thick glandular disks; the short styles are topped with three-branched stigmas. Fruits possess a finely rugose surface layer that is shed prior to ballistic dehiscence of the inner layers; in this fashion the three seeds produced by each fruit are propelled a short distance from the parent plant. During the Revolutionary War, dried leaves of Ceanothus americanus were used as a substitute for tea; the leaves are, however, devoid of caffeine. Native Americans used preparations of root bark for medicinal purposes, a practice that continues today amongst herbalists. Alkaloids from the root have been demonstrated to exert a mild effect in lowering blood pressure. 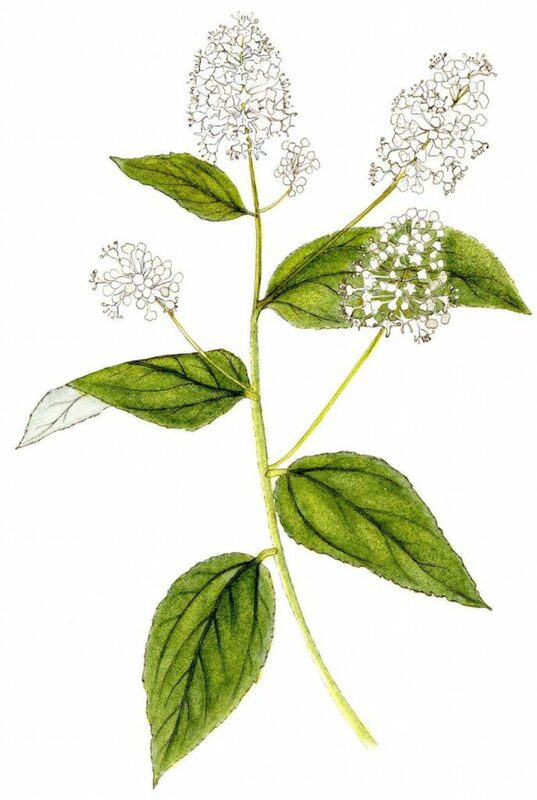 New Jersey Tea is a versatile dye plant, yielding green dye from flowers, red dye from roots, and cinnamon-colored dye from whole plants. Flowers are rich in saponins and will form a gentle lather when crushed and mixed with water. Linnaeus coined the name Ceanothus americanus in his landmark 1753 work, Species Plantarum; in doing so he arbitrarily applied a genus name that was first used by Theophrastus, the “Father of Botany,” for a thistle or thistle-like plant (Ceanothus translates from Greek as “spiny plant”). The genus Ceanothus as presently understood consists of 58 species that range throughout most of North America and Central America; the center of diversity is California where species of Ceanothus are known collectively as California Lilacs. Ceanothus is classified in the plant family Rhamnaceae. New Jersey Tea favors clearings and barrens in dry upland forests; it also occurs in abandoned fields and prairies. It thrives in gravelly soils. Well established plants are tolerant of fire by virtue of their ability to sprout vigorous new shoots from large, deep, roots. The fragrant nectar-bearing flowers attract butterflies, bees, and diverse small insects. Foliage serves as a larval host for several butterfly species, notably Spring Azures, Summer Azures, and Mottled Duskywings. New Jersey Tea can be cultivated in sites with full sun to part shade and light soil texture. As such, it is a candidate for landscape plantings or naturalistic wildflower settings. As is often the case with deep-rooted plants, it can be challenging to transplant. The flowering season, ranging from May to June in Virginia, is relatively brief. Propagation by seed is best; cloth bags will help catch the seeds as fruits mature; brief scarifying with hot water (180 °F to 200 °F) followed by stratification at ca 40 °F for two or three months will improve seed germination. While the overall conservation status of New Jersey Tea is secure, it is considered a rare plant in some extreme portions of its range. Ceanothus americanus is generally rare in the northeast portion of its range, and especially so in the state of Maine. Ceanothus americanus is widespread in eastern North America, extending from New England, and southern Canada west to Wisconsin, south to central Texas and east to mid-peninsular Florida. It can be found throughout Virginia, but remains to be documented (or may be absent) in several counties of the Coastal Plain and Eastern Shore. 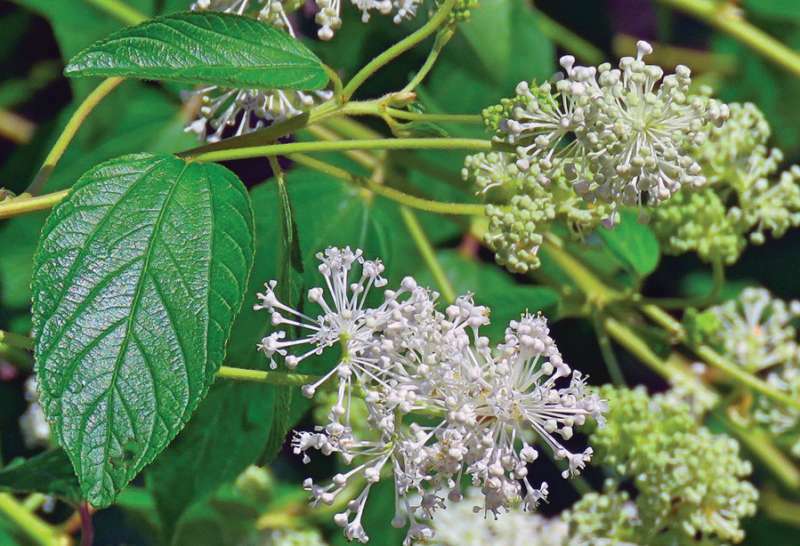 Gardeners should not collect New Jersey Tea in the wild and should be certain that all native plants purchased for home gardens have been nursery-propagated, not wild-collected. For retail sources of nursery-propagated plants and responsibly collected seeds, visit https://vnps.org, email info@vnps.org, or call 540-837-1600. To see and learn more about interesting species of plants native to Virginia, visit https://vnps.org and contact your local chapter of VNPS (details on the website) for times and dates of programs and wildflower walks in your area.